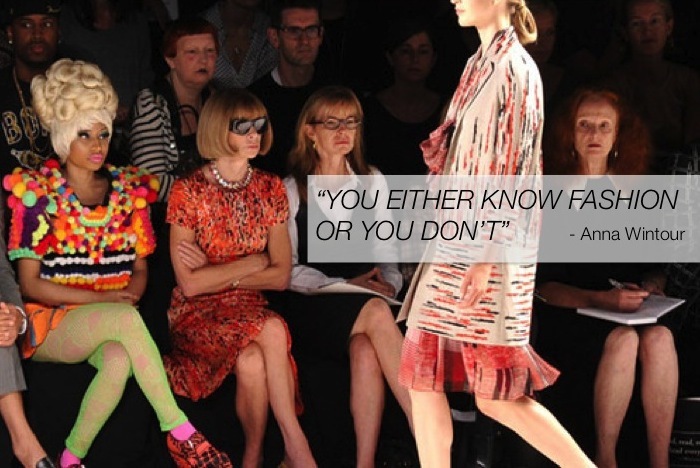 There is no one more fitting to quote during New York Fashion Week then the queen bee herself, Anna Wintour. I just love everything about this photo, from the composition to Anna's classic stark expression. Even though I can't be at the shows, I'll be watching the livestream of Rebecca Minkoff's Fall 2013 runway show tomorrow at 3pm, you can RSVP on Facebook. Don't you just love technology? Love this quote! I've caught a few glimpses of Anna in my building and she's just as fabulous as she seems! I really hope that one day I will get to know fashion. Love the quote and love the picture! Nicky Minaj next to Anna Wintour! The difference in style couldn't be bigger! oooh have a blast in San Diego, Chelsea! And Happy Birthday to your grandmama! Thanks again for the shoutout :) You rock, Chelsea! Thanks for the heads up! I actually live in New York but work at a magazine and we are closing an issue and have deadlines so alas I can not attend. hunkering down for the snow storm. Should be a chill weekend. Just finding your blog through StyleMindChic. This quote and photo together are perfect! Cracked me up with Nicki Minaj probably feeling so chic... Have a nice time with your grandmother. How lucky you are to have her still! Love the photos, Nicki manaj next Anna Wintour & the quotes....= perfect.